A chance meeting at a recent MU Postdoctoral Association social event brought together two Australian postdoctoral scholars who are thousands of miles from home conducting research at Mizzou. 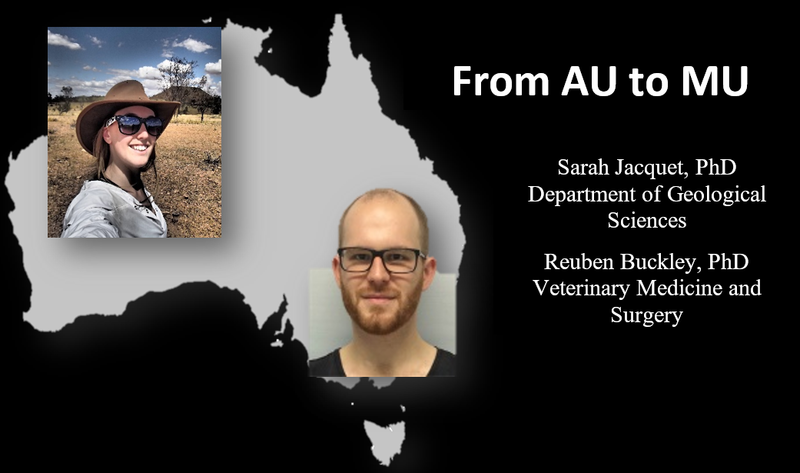 Although Dr. Reuben Buckley (Veterinary Medicine and Surgery) and Dr. Sarah Jacquet (Geological Sciences) are on separate research paths, their story is a reminder of the global community we can build here at Mizzou. We share with you their paths to Mizzou. While pursuing a doctoral degree at the University of Adelaide in Australia Dr. Reuben Buckley studied computational biology and mammalian genomics with a focus on retrotransposons, a type of DNA element that makes up almost 50% of our genomes. Buckley is a postdoctoral fellow in Veterinary Medicine and Surgery focusing on Characterizing structural variation within the domestic cat genome. “MU granted the freedom to learn and become more acquainted with next generation sequencing data”. I have only been at MU for a short time and have mostly been focusing on setting up computational and genomic resources for my new lab. Fortunately, my PI, Dr. Leslie Lyons, has provided me with amazing resources that have made these tasks much easier than they would have otherwise been. Moreover, by being involved at the ground level, I have had the opportunity to learn about what goes into setting up a computational biology research environment, lessons that will be extremely valuable if I decide to set up my own research group in the future. Buckley adds “Another great thing about being at MU is that I have been lucky enough to attend two separate high-profile research conferences: the American Society for Human Genetics in Orlando and Plant and Animal Genomes in San Diego. These conferences cater to thousands of attendees and feature some of the highest impact research from around the world. If I had not moved to the US to do research at MU, I probably would not have had the opportunity to attend these conferences”. Buckley enjoys the field of genomics and hopes to one day have an academic position. “I enjoy travelling, and I am grateful that my career affords me the opportunity to live in different countries”. Since arriving at Mizzou last semester, Dr. Sarah Jacquet says, “I have been impressed by the inclusive mindset across campus. Everyone has been more than willing to help me with any complication I might have. It is also good to see so many opportunities offered to undergraduate and graduate students at the departmental level”. One of those opportunities for Jacquet is the Preparing Future Faculty (PFF) Postdoctoral Fellows for Diversity Program. As a member of the inaugural cohort, the program extends to all aspects of her academic career. For instance, the program provided Jacquet with the chance to get a certification in college teaching, something not often offered at the doctoral level. The program also allowed her to engage at the departmental level in various activities, from interviewing with postdoctoral candidates to teaching and outreach at the area high school, while participating in “Science on Wheels”. Jacquet’s experience in the PFF program is helping to build her academic profile in areas other than just research. “The program has set the groundwork for a career in academia, and represents my first step (of many) towards a tenure-track position,” says Jacquet. Jacquet’s research focuses on Paleobiology and Biostratigraphy, encompassing the emergence and diversification of complex animal body-plans throughout the fossil record. The overarching aim of Jacquets research is to use a combination of high-powered imaging techniques (such as micro-CT) to develop new methods of examining and analyzing these long-dead organisms. This provides novel insight into the lives of these past organisms-how they lived, moved, ate and defended themselves against predators. Jacquet credits her mentors, Dr. James Schiffbauer and Dr. John Huntley have been instrumental to her career. “They have provided me with key advice on how to expand my skills, whether teaching or research-based, and are keen to work with me on various projects. Certainly, now I have a fresh look on my research and the direction it is going in, which will help me to establish a line of research extending beyond the two-year postdoc” says Jacquet.